Pressurize your detailing chemicals for maximum results! Chemical resistant pump delivers an even flow of chemicals. Use with wheel cleaners, detailers, protectants, all-purpose cleaners and more. Lock button �on� for one-hand spraying. 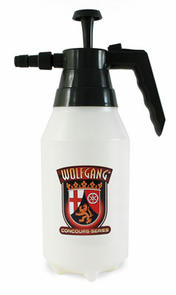 The Wolfgang Chemical Resistant Pressure Sprayer is a compact pressurized delivery gun for detailing chemicals. The Wolfgang Chemical Resistant Pressure Sprayer is perfect for spraying wheels, tires, and wheel wells with powerful cleaners or for coating the engine compartment in degreaser. The sprayer is built to withstand a broad range of chemicals and it's capable of delivering stronger mixes of chemicals without clogging. This is a self-contained compressed air sprayer. Simply pressurize the bottle by using the pump on top and spray by squeezing the trigger. The stream is adjustable from a jet to a wide-fan pattern. The Wolfgang Chemical Resistant Pressure Sprayer is perfect for high volume detail shops, mobile detailers, or anyone looking to accelerate their detailing process. Check out the Double Barrel Extension Sprayer to extend the Wolfgang Chemical Resistant Pressure Sprayer's reach! Bought this to use with spray detail for when I dry the car. It works awesome. Need to pick up a few more. Decided to purchase this sprayer for my waterless washes. It works as advertised and saves me time. Can't comment on durability as I've only been using it for a few months. I use this product with WD-40, solvent, and windex. Much easier to use than normal spray bottles and you get a more even coverage while using less product.